It can’t be stressed enough that diet and nutrition are a key contenders in the present and future states of our bodies. Health and nutrition go hand and hand. Last week, we discussed how there are certain foods (along with water) that can help maintain and even improve your oral health. The same can be said on the opposite side. There are foods and beverages that pose a threat to the quality and health of your teeth and gums. It is not to say that you can never consume any of the items that we place on this list (everything in moderation), but it would be wise to avoid, as often as possible, the following food and drinks; not only for the sake of your oral health, but also your overall health. According to the American Dental Association, the following foods and drinks are on the top of the list because they either contain a high amount of sugar or they put you at risk for a dental emergency, like chipping or breaking; or they are both. Hard Candies: Not only are hard candies almost entirely made of sugar, they are also, well, hard. A constant barrage of sugar puts you at a higher risk for cavities. Chewing or clinking around something hard in your mouth can accidently cause a chip or break in a tooth. There are actually zero benefits to eating hard candies. However, if this is something that you love, try a sugar-free version. Sticky Food (like dried fruit): While pleasing to the palate, sticky dried fruit is actually terrible for your teeth. Not only are they high in sugar, but also due to the sticky nature of these snacks, they tend to stick to your teeth more and for longer than other types of food, like fresh fruit. If you must indulge, be sure to brush and floss your teeth after you are done enjoying your sticky snack. Citrus (too much of it): Citrus is highly acidic, which overtime can make your teeth more susceptible to decay. Citrus and citrus juice, in above average amounts can also irritate your mouth and cause sores. While citrus does have beneficial properties, such as vitamin C, be careful of how much you consume. Ice: Break your ice chewing habit! While it is made of water and contains no sugar, regularly chewing ice puts you at risk for a dental emergency. A prolonged ice chewing habit also causes teeth enamel to wear down over time. Coffee: Drinking too much coffee on a regular basis can be harmful to your teeth. What makes coffee unhealthy is the fact that most people add sugar or other sweeteners. Coffee is also acidic. Overtime, it can also cause your teeth to brown or yellow. The key is moderation and drinking plenty of water alongside of your coffee intake. Make sure to also brush your teeth after drinking coffee to reduce stains on your teeth. Soda and Sports Drinks: Just say no. 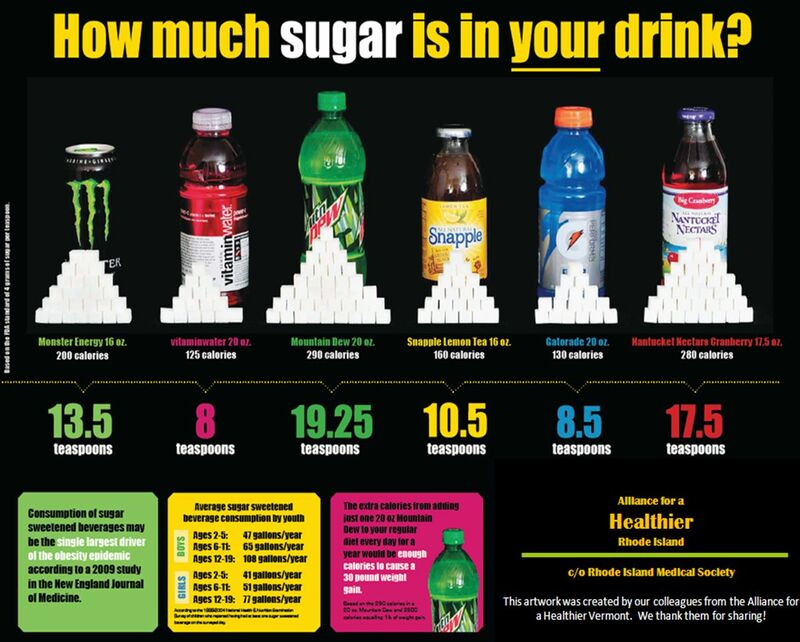 Both sodas and sports drinks contain inordinately high levels of sugar. Excessive sugar consumption can lead to cavities, tooth decay, plague build-up, and enamel destruction. These beverages are also quite terrible for your overall health. If you must, try and make it an infrequent occasion. We have control over what we put into our bodies. Remember, you are what you eat (and drink). If you want to feel good, look good, have energy, and show the world your beautiful smile, start with your diet. You might be surprised how much better you feel and perform when you are putting the right things into your body. One of the best changes you can make is to cut down on your sugar intake. Take care of you this year!